I am making this thread so that all the ACI Forum members can discuss about the upcoming Formula 1 event between 25th and 27th Oct. All the members please upload your pictures clicked at the event. Good idea. How many from here are attending the Indian GP? Not me!! But all those Vettel fans who would be attending the even are surely in for a huge treat. Thats because he is 100% gonna lift the Championship Trophy again. And this time its going to be here at the Indian GP!! 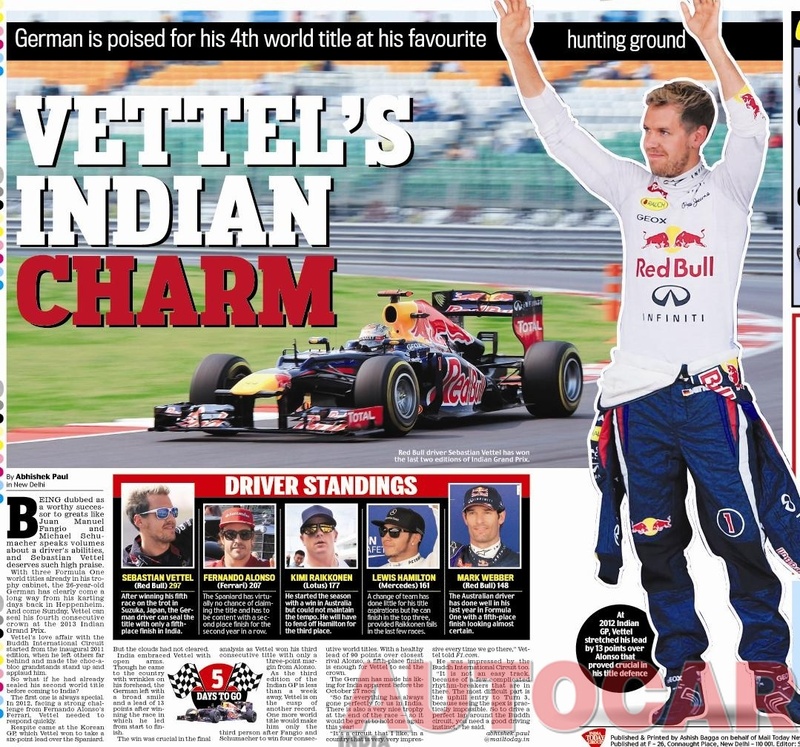 Vettel said that India is lucky for him and he had won 2 gp's here! and being a Vettel fan, it is good for me. And BIC is just 10km away from my house so I watch all three days race and haven't missed a single day over there! Hahahaha kidding... But no, i am a little jealous actually!! Well i am not a big Vettel fan and that's because he doesn't drive a Ferrari!! I am a die-hard Ferrari fan. And i really really hope Alonso beats him atleast here this sunday!! Well.. Enjoy your weekend!!! And oh, pls do post some pics!! Lotus is going to give Mercedes and even Ferrari a run for their money!!! 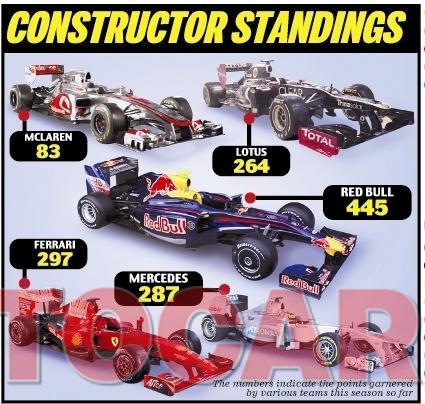 They are currently 4th in the Constructor's Standing, but they have just 23 points them and Mercedes, and just 33 points between them and Ferrari. Sadly, our Indian team is lagging behind and i think so they should also get an opportunity. Talking of Narain, it was his bad luck due to which he didnt get a chance this time. All the people at BIC, who come to watch the race just for fun supported him! And when he passes all used to get up! 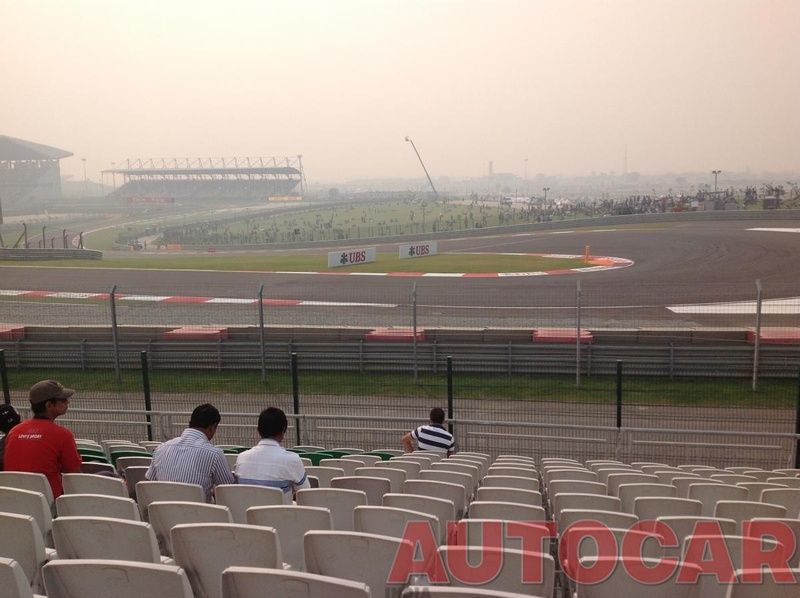 Its sad that there wont be a GP next year at Buddh. As the saying goes, once a race goes of the calendar, its pretty difficult for it to come back. I hope that isnt the case. I attended the inaugural GP in 2011 and it seriously was a proud moment for me. My first ever Grand Prix that I saw live at the circuit was Malaysia 2004. I got to see what I wanted. Michael take Pole, the win and the fastest lap in the Ferrari. Well they have claimed a return in 2015 at the start of the season but Vicky Chandok himself has fears that F1 might not come back at all. That will be really sad because the JayPee group did a fantastic job of the circuit and the facilities. Two days ahead of the Formula 1 race in Greater Noida, a petition seeking to stay the mega event was on Thursday filed before the Supreme Court which agreed to hear it on Friday. A bench headed by Chief Justice P Sathasivam, before whom the matter was mentioned, said the plea will be heard on Friday. The petition has been filed by one Amit Kumar seeking the court's direction to stay the event, to be held on Saturday in Greater Noida, on the ground that the organiser has not paid the entire tax amount to the Uttar Pradesh government for first Formula 1 race held in 2011. The Akhilesh Yadav government had recently approached the apex court seeking its permission to withdraw the June 27, 2011 decision of the then UP government headed by Mayawati granting exemption to Jaypee Group from entertainment tax. It sought that the company be directed to pay entire amount of entertainment tax due to it for the 2011 formula 1 race. Kumar had earlier in 2011 also filed a petition in the apex court challenging exemption of entertainment tax given by the then BSP government in UP for the event and the apex court in its interim order on October 21, 2011, had directed the Jaypee Group to deposit 25 per cent of sale proceeds from tickets in a separate account which would not be operated without its permission. India's first Formula 1 event was held in Greater Noida, near national capital, on October 30, 2011. News Article on DNA's website!! What is wrong with these people!!! Last minute dirty politics!! Who is this Amit Kumar? And he realise today, that entertainment tax of 2011 was still unpaid? What was he doing? Sleeping till now!!! Sorry i am a upset!!! But as a Formula One fan any one would be!! As it is F1 isn't coming to India next year, with this we are just nailing the coffin!! If this stay gets imposed the guys at Formula One would never even think of returning!! Not in 2015.. Not in 2016.. NEVER!! EVER!! well the event was organised extremely well, the only problems were that there was extreme traffic that day on Noida-Greater Noida expressway. Last year though, it was flat and all the lambos and Ferraris in the town revved high! also, the food was damn expensive there. A bench headed by Chief Justice P Sahasivam, before whom the matter was mentioned, said the plea will be heard on Friday. Well traffic is bad at any F1 circuit. Even when I went to Sepang in 2004 it took me more than 2 hours to come back to KL. Sunday's Indian Grand Prix will go ahead as planned after a hearing into tax issues was delayed until next week. India's Supreme Court was due to hear a petition seeking to cancel the race on Friday because organisers have allegedly not set aside entertainment taxes from previous races. 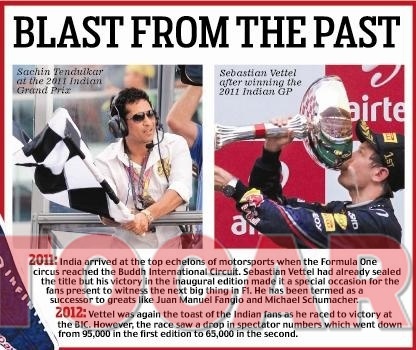 The issue is a contentious one being fought by local political activist Amit Kumar, who successfully campaigned for Formula One to be classified as entertainment rather than a sport in 2011. As a result it does not benefit from certain tax exemptions. However, the hearing of the petition, which had the potential to derail the running of this weekend's race, has been postponed meaning the race will go ahead as planned. "The hearing will now take place next week," a lawyer involved with the case told AFP. "This means the race can go ahead." So thankfully the Indian GP is going to go through without any obstructions!!! Meanwhile on the track Vettlel has dominated today's both practice sessions!! that day we took a different route i.e. opposite to Delhi and came from another route. I was in my uncle's C 220 and driving that on that route was really a nightmare! The car got stuck and it took half and hour to come out of the ditch! Prashantroxx this is turn 4, right..? Where Kimi spinner today!! Right na..? The commentators were saying that the crowd was too less!! Something like Bahrain GP during the riots n all.. I am in turn 123 picnic stand and it amazing ,best bang for buck literaly .I can see pit straight and back straight and it much better than turn 10. turn 4 is awesome except that people tend to stand and nobody can see the cars in the race you might have to stand on the seat in star stand 1. Vettel completes clean sweep in the practise sessions. Bahrain GP also had problems like ours, and that is from 2012 gp this was on turn 3, starting point of the back straight. I chose this one as at this point all the cars cone to a halt and then they move fast!